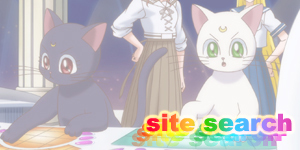 Mamoru is targeted and Princess Sailor Moon rises! 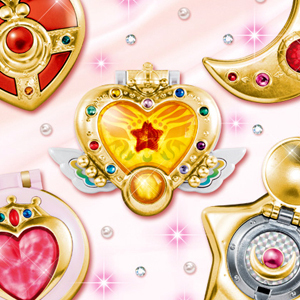 Cover: While the cover is extremely busy due to the numerous plots covered in these four episodes it does have some great shots of Princess Sailor Moon, Mio and Beryl that makes up for it. 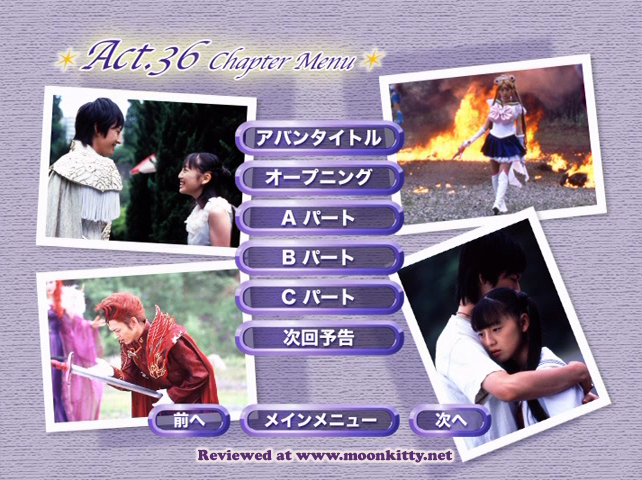 The Menus: With the number of characters on the cover I had no idea who the main character would be for the DVD menus. Imagine my surprise when Beryl popped up! Not a bad choice but definitely a surprising one though it does make sense considering how much development the character gets in these episodes compared to the flat out nothing she's gotten up until now. As usual, menus load fast and look very nice. The Special Features: Wow! What a surprise! Having had two on two conversations with the five main girls for the previous 8 DVDs, this one features one massive group round table conversation with them all being asked questions and helped along by one of the directors of the series, Suzumura Nobuhiro. The girls appear very nervous with not only an adult in the room but also their boss so they aren't as forthcoming with genuine answers as they were in the previous more intimate behind the scenes clips but they do open after after w hile and begin to joke around. Unfortunately though, their answers fall of the superficial and "girly" side of things which reminds us that they are still 16 years old for the most part. For example, the director asks them how they think they'll change in the next year or so and they all start talking about how much weight they'll gain or who will marry first. The director was clearly asking about their personal growth but this went right over the girls' heads. 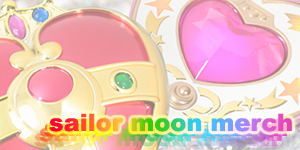 We also get some comments from another director from the show, Maihara Kenzou who tells us that his favourite episode (surprisingly) was Act 2 because it was the first episode to introduce a new character (Ami/ Sailor Mercury) and liked how there were a lot of hidden meanings in it (perhaps talking about "Venus" written on Minako's mini disk?). 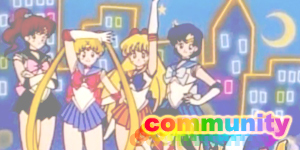 He goes on to discuss the writing and directing of Sailor Jupiter and Mercury's characters from the manga and says that he feels Jupiter's remains the closest to the source material. 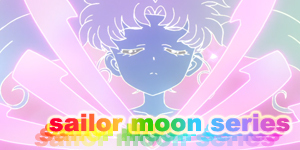 Interestingly he says that Darkury (Dark Sailor Mercury) has aspects of Ami's character and that she wasn't just plain evil. Having just finished directing the Special Act he also talks about that and explains that he went for a different feel for it than the series and describes it as the cast's graduation episode. 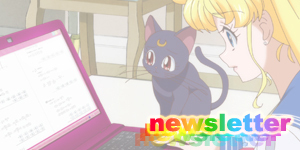 As usual there are several deleted scenes, among them a great one featuring Usagi being called to Ami's mother's house for questioning over her daughter's disappearance. 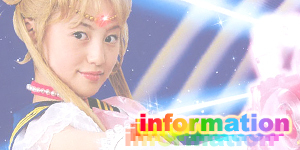 Usagi tells her to look for Ami and her mother tells her that she's already looked at her school and cram school. 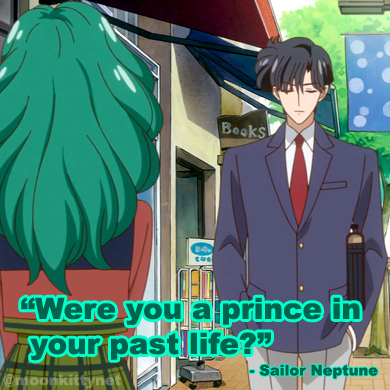 Usagi responds to this by asking her to look somewhere else then. Ami's mother then realises that she doesn't know her daughter at all as she doesn't know what else Ami does or where she goes when not studying. A very powerful scene that should definitely been added as it shows more of a fault on her parenting than the finished episode did. The documentary finishes with a note saying it will be continued on the next DVD. 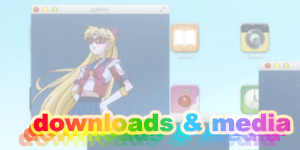 I can't wait as this had so much information and bonus material in it I would recommend it to any Moonie. The Episodes: The series really begins to stretch it's creative roots with the four episodes on this disk. 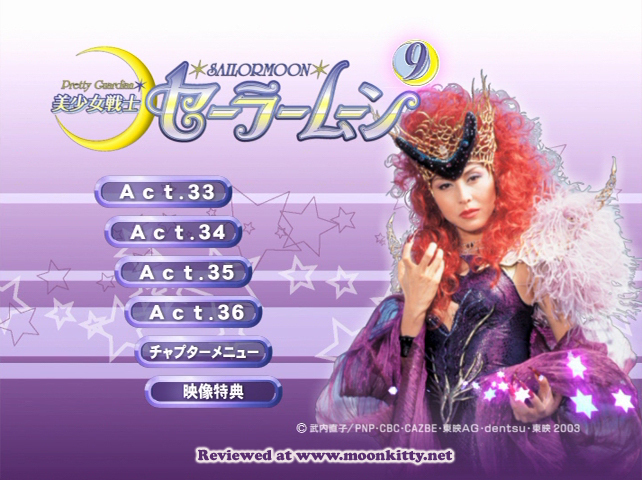 Acts 33 and 34 explore Ami and Rei's parents and home life, something missing from almost every incarnation of the Sailor Moon story and is very well told with great performances all around, especially from Mariko Tsutsui as Ami's mother and Takeshi Masu (from Shinobi and Kamen Rider Adito) as Rei's father. 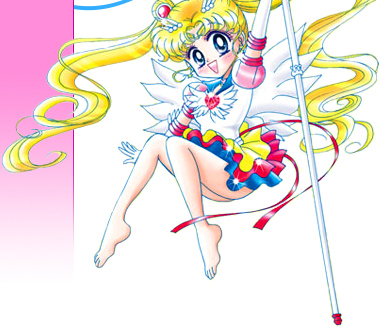 Acts 35 and 36 are essential viewing as they give us our first glimpse of the uber powerful Sailor Moon form, Princess Sailor Moon and expand on Mio's role in things as well as Queen Beryls true aims. A super DVD well worth your time.